Aarthi Ananthanarayanan’s volunteer experience at Calvary Women’s Services demonstrates just how flexible and unique our volunteers can be. She currently offers her professional skills as a Job Lead Facilitator for Step Up DC and is assisting the development team with preparations for the Hope Awards Dinner. 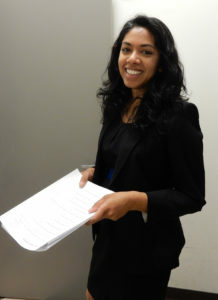 As if that were not enough, Aarthi has also taught salsa dancing in the Life Skills, Education and Arts Program (LEAP). We are grateful that Aarthi brings so many different skills to Calvary! I was born in California, grew up in Connecticut and then moved back to San Francisco after college. I’ve been in D.C. for two years. I used to be the Captain of my college ballroom dance team. It’s a place where I feel a real connection to the women and where it feels like my skills are useful (not easy to find in a volunteer gig). It has been great to form a broader interaction with women through both Step Up DC and LEAP. The interactions with the women – the ways they support each other and are so kind to me. It has taught me a lot. I also love spending time at the Anacostia Art Center right next door – a side of D.C. invisible to me before. I have been surprised by how feeling helpful to the women and getting the most out of my experience required me to open up and be prepared for some tough but eye-opening interactions. For instance, I had never done the math on what hourly pay adds up to in terms of an annual salary, even for what we might consider a “decent wage”, like $17/hr. How about two? Female family.